It is officially fall. Time for sweaters, jeans and boots in my opinion;) To get my firsties engaged and having fun while learning I made up a few Fall/Autumn center games. First up is my Raking in the Sight Words. I used plastic rakes from the Dollar Store and glued magnets to the end of the rakes. 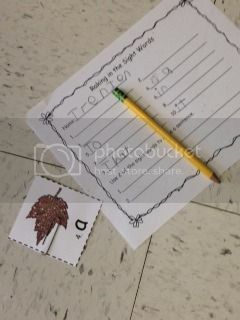 Next I printed out my sight word game and placed metal paper clips on the leaf cards. 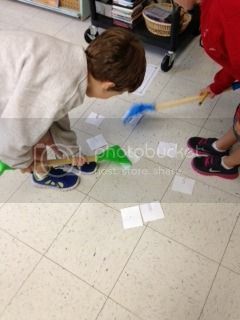 The kids then had fun raking in sight words. They couldn't wait for it to be their turn at this center. Click the picture to see it better. 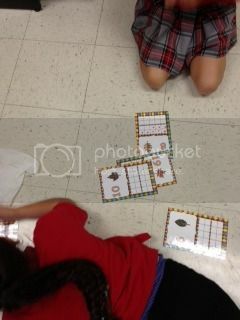 We also got into the fall/autumn spirit with our math centers too. ten frames to help out. These were match the number to the correct ten frame. 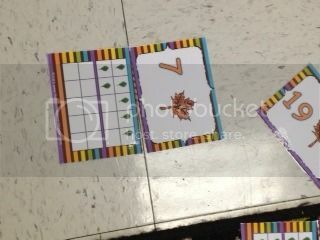 They made the ten frame by using dry erase markers on the laminated cards.